This offline chat message (via MyLiveChat) that came in from “Deal-Storm.com” looks like a possible malware attempt. Did you get it too? What do you think? Why should I click the link? The message does not apply to me, I don’t sell products. Does the link look right? The link looks simple and real, and not a spoof . If the message applied to me (I don’t sell products) and the google search showed a real company at the other end I might have fallen for it. NEVER EVER download a document before giving it the small test. Google the company first as well as review their website (without clicking on the links they sent). Message: Hello, Dear Sir / Madame. Please download it and have a look at it. Is everything currently in stock?https:||deal-storm.com|files|doc|wholesale.docLooking forward to your reply. 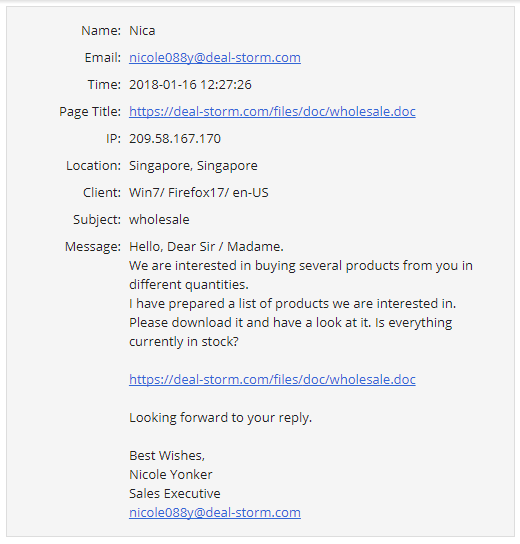 Also the Name (Nicole), IP address (209.58.167.170), and email address (nicole088y@deal-storm.com) are on the stopforumspam.com Singapore list for January 20th 2018.